Nouvelle représentation Des Côtes Nord et Est de l'Asie : pour servir d'éclaircissement aux Articles du Supplement de L'Encyclopedie qui concernent le passage aux Indes par le Nord. 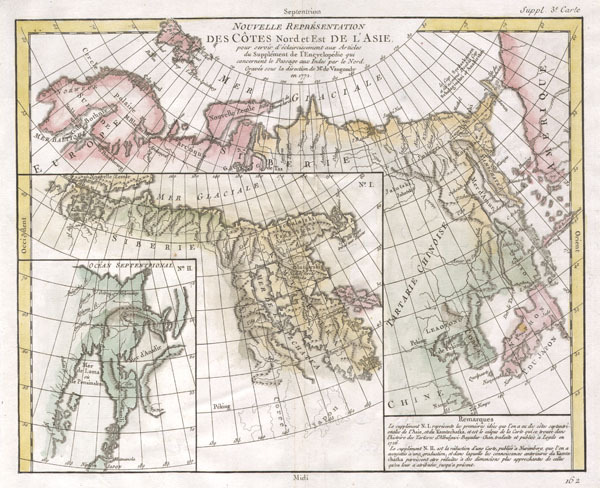 A comparative map of the three conflicting theories on the Northeast Passage, the northeast coasts of Asia, and the American Northwest. The Northeast Passage, much like American's Northwest Passage, was a long sought after sea route through the Arctic that would save European merchantman the expense of rounding Africa in order to access the trade riches of East Asia. This map, in one of the first obtainable examples of comparative cartography, lays out three theories regarding the Northeast of Asia. Knowledge of this area was, at the time, speculative at best. Shows many unknown island, misshapen representations of Kamtschaka, Japan, Hokkaido (Yesso), Alaska, and the Behring Archipelago. Notes Peking (Beijing), Nanking (Nanjing), Corea (Korea), Jedo (Tokyo)and Nangasaki (Nagasaki). This map is part of the 10 map series prepared by Vaugondy for the Supplement to Diderot's Encyclopédie, of which this is plate 3. This seminal map series, exploring the mapping of North American and specifically the Northwest Passage was one of the first studies in comparative cartography. Denis Diderot (October 5, 1713 - July 31, 1784) was a French Enlightenment era philosopher, publisher and writer. Diderot was born in the city of Langres, France and educated at the Lycée Louis le Grand where, in 1732, he earned a master of arts degree in philosophy. Diderot briefly considered careers in the clergy and in law, but in the end chose the more fiscally challenge course of a writer. Though well respected in philosophical circles Diderot was unable to obtain any of the government commissions that commonly supported his set and consequently spent much of his life in deep poverty. He is best known for his role in editing and producing the Encyclopédie . The Encyclopédie was one of the most revolutionary and impressive works of its time. Initially commissioned as a translation of Ephraim Chambers' Cyclopaedia, or Universal Dictionary of Arts and Sciences, Diderot instead turned into a much larger and entirely new work of monumental depth and scope. Diderot's Encyclopédie was intended to lay bare before the common man the intellectual mysteries of science, art and philosophy. This revolutionary mission was strongly opposed by the powers of the time who considered a learned middle class it a threat to their authority. In the course of the Encyclopédie production Diderot was imprisoned twice and the work itself was officially banned. Nonetheless, publication continued in response to a demand exceeding 4000 subscribers. The Encyclopédie was finally published in 1772 in 27 volumes. Following the publication of the Encyclopédie Diderot grew in fame but not in wealth. When the time came to dower his only surviving daughter, Angelique, Diderot could find no recourse save to sell his treasured library. In a move of largess, Catherine the II Russia sent an emissary to purchased the entire library on the condition that Diderot retain it in his possession and act as her "librarian" until she required it. When Diderot died of gastro-intestinal problems 1784, his heirs promptly sent his vast library to Catherine II who had it deposited at the Russian National Library, where it resides to this day. Supplement to Diderot's Encyclopédie, ou dictionnaire raisonné des sciences, des arts et des métiers.. Very good condition. Original centerfold as issued. Original wide clean margins. Platemark visible. Blank on verso. Pedley, Mary Sponberg. Bel et Utile: The Work of the Robert de Vaugondy Family of Mapmakers. 402.